Before you continue reading this post, make sure you are aware of the full text search enhancement for quick find that has been introduced with Dynamics CRM 2015 Update 0.1. 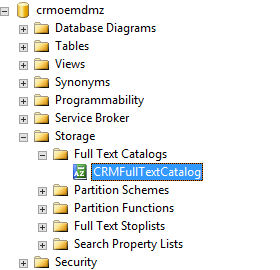 In case you are not aware of this feature, you can refer to my another blog post – https://debajmecrm.com/2015/11/10/optimize-your-global-search-by-enabling-full-text-search-in-dynamics-crm/. This post would give you an idea about how to enable the feature in CRM and the benefits you get by enabling the same. Now coming back to the topic, say you installed update 0.1 in your Dynamics CRM server. Next day you come to office, open your CRM to see the wonderful search working. You open your accounts grid and then search with a search phase. Alas, you see CRM is not performing the Full Text search as it should be. If you are in this situation don’t be upset. Once you finish reading this blog, you might end up with an optimistic feeling of making it work. top 251 ( select count(1) from Account where ParentAccountId = "account0".AccountId ) as "HierarchyDataChildCount6dcd9e4c001441b09237d51a34853d55"
Check for the FORMSOF method used by CRM for full-text search. If your CRM is not using this then it is not using the full text search. We are not going to let CRM off just like that. If you are like me and wants to dig a little deep well you are in here. So let’s open your SQL Server here. Open your CRM Organization Database –> Storage –> Full Text Catalogs –> CRMFullTextCatalog. Double click on this. The tables which are full text indexed will appear on the right hand pane of the popup window. Here we can see that only two tables have been enabled for full text index. If CRM would have completed the full text search successfully, then you would find multiple tables enabled for full-text search. So the big question here. Would enabling the AccountBase table for full-text indexing manually make CRM to go for full text search? The answer is BIG NO. This is because CRM uses other set of tables to identify whether the full-text search should be used for quick find queries. So what are the two tables. Let’s see. The first table which is prime importance here is the EntityIndex table. This is the table where CRM maintains all type of indexes for an entity including the primary key index. Let run the below SQL query. Select * From EntityIndex Where IndexType = 9 and Name = ‘AccountBase_FullText’. Running this query on an organization database where Full Text search has been configured successfully would give you a result like the one shown below. IndexType The type of the index. 9 is the index for full text search. Now where does CRM maintain the columns on which full text indexing should be performed? CRM maintains it in another table called IndexAttributes. Based on the IndexId of the EntityIndex table, let’s run a query on the IndexAttributes table. As you can see from the above screenshot, the query returned 3 rows. The reason is that the quick find view of the customers contains only three columns. Only the columns in the quick find view which are of type text are enabled for full text search. A quick glance on the important fields of this entity. IsQuickFindManaged Boolean to indicate if CRM will perform full text searches for this column. So now you know fully from where CRM does all it’s magic. Since you know the in and out of this now, let’s now understand the scenarios when full text search does not work even after enabling it through system settings. Last but not the least, if your CRM async server and CRM App server are different (which is for majority of the CRM deployments), remember to install Update 0.1 on all CRM app servers as well as CRM Async servers. Although this may sound silly, but recently I got multiple complaints from my customers saying that full text search was working great in the dev. environment (APP + ASYNC on the same server), but not working in PROD. The reason is the administrator of their company installed the update only in the APP servers and not the async servers. Hope this gives you an insight of CRM Full text search. Till then you read one or more of my posts, happy CRM’ing. for that matter, this post is all about going under the hood and understand the details. In fact nothing unsupported is suggested and done in this post. The final three troubleshooting areas that I provided if full text search does not work, are all supported.